In Illustrator, a curve segment is also called a Bezier curve. A Bezier curve consists of two anchor points connected by a curve segment, with at least one direction line attached to each anchor point. 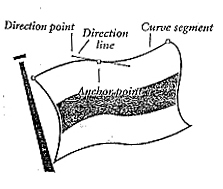 If an anchor point connects a curve and a straight-line segment, it will have one common direction line. If an anchor point connects two curve segments, it will have a pair of direction lines. 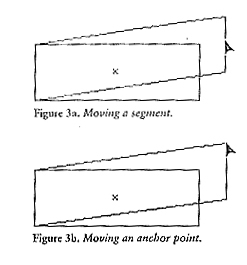 If you move an anchor point, segments connected to it will reshape. If you move a curve segment, connecting anchor points will not move along with it. If you move a line segment, connecting anchor points will also move. Press and drag the anchor point or segment. 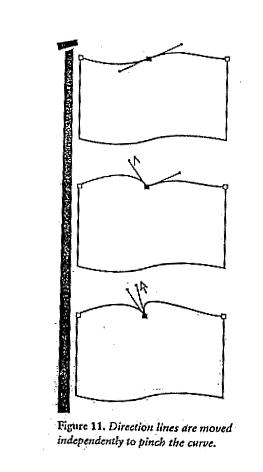 Hold down the shift to constrain the movement of an anchor point to 45, 90, 135, or 180 degrees. If all the anchor points on the path are selected, you will not be able to move an individual point or segment. Deselect the object, then reselect an individual point. Hold down the shift and click to select more than one anchor point at a time. 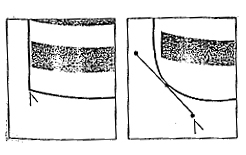 A more precise way to reshape a curve is to lengthen, shorten, or change the angle of its direction lines. 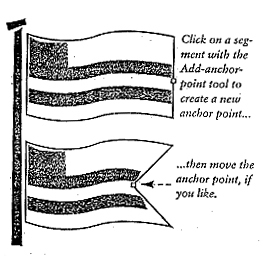 Click on an anchor point. Click on the edge of the object. The anchor points will be hollow. Choose the convert-direction-point tool (it’s under the pen tool), or hold down control with any selection tool. Press on an anchor point, and then drag away from it. Direction lines will be created as you drag. The further you drag, the rounder the curve will become. To further modify the curve, choose the direct selection tool, then drag the anchor point or a direction line. Direction lines on a smooth curve form a straight line in relationship to each other even if one direction line is moved, or the curve segment or anchor point they are connected to is moved. If the new curve segment twists around the anchor point as you drag, keep the mouse button down, rotate the direction line back around the anchor point to undo the twist, then continue to drag in the new direction. Click on the edge of the object to display its anchor points. 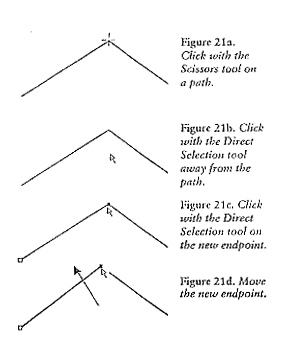 Choose the convert-direction-point tool (or hold down control). Click on the curve anchor point. Don’t drag! Its direction lines will be deleted. The direction lines in a pinched curve rotate independently of each other, they don’t stay in a straight line. Click on the edge of an object to display its anchor points. Press and drag a direction point at the end of one of the direction lines. The curve segment will reshape as you drag. Choose the direct selection tool. Click on an anchor point. Drag the other direction line for that anchor point. To revert an independent-rotating direction line pair back to its previous straight line alignment and produce a smooth, unpinched curve segment, choose the convert-direction-point tool, then click on either direction point. Click on the edge of the object. A new, selected anchor point will appear. Repeat, if desired, to add more points. If you don’t click precisely on a segment of an object, a warning prompt will appear. Click “OK” and try again. Hold down control to use the add-anchor-point tool when the pen tool is selected and is over a segment. The Add Anchor Points Filter inserts one anchor point midway between every two existing anchor points. 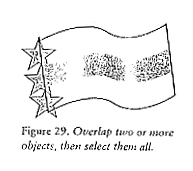 Select an object, or objects. Click on an anchor point. The point will be deleted and an adjacent point will become selected. 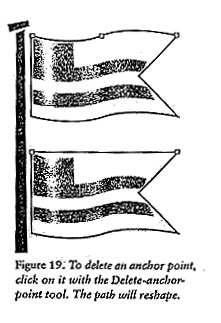 Repeat to delete other anchor points if desired. If you do not click precisely on an anchor point, a warning prompt will appear. Click “OK” and try again. An open path can be split into two paths and a closed path can be opened using the scissors tool. 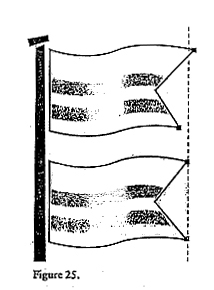 A path can be split at the anchor point or in the middle of a segment. Click on an object to display its anchor points. Click on the object’s path. If you click on a closed path, it will turn into a single, open path. If you click on an open path, it will be split into two paths. If you click on a segment, two new end points will appear, one on top of the other. If you click on an anchor point, a new anchor point will appear on top of the existing one. The new end points will be selected and will overlap each other. Click away from the object to deselect it. Click on the object’s path. Click on the new endpoint, then drag away to reveal the endpoint underneath. You cannot split an open path if it has text on it or inside it. 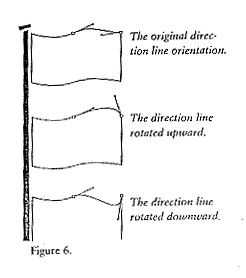 The average command reshapes one or more paths by precisely realigning their end points or anchor points to the horizontal and/or vertical axis. Choose the direct selection tool Hold down Shift and click on two or more anchor points. You might want to zoom in on the objects so you can clearly see the selected points. Click “Both” to overlap the points along both the horizontal and vertical axes. Choose this option if you want to join them later into one point. Click “Horizontal” to align the paths along the horizontal axis. Click “Vertical” to align the points along the vertical axis. Click “OK” or press return. If you align two end points on top of each other and then execute the Join command, they will combine into one anchor point. If the end points are not on top of each other, a new straight-line segment will be created between them. 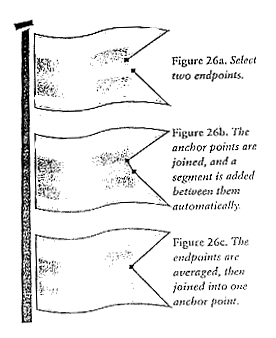 The Join command will not add direction lines to the new anchor point. If you want to combine two endpoints into one, move one endpoint on top of the other manually, or use the Average command (Axis:Both) to align them. Hold down Shift and click on two endpoints or marquee them. Choose Object>Path>Join. If the end points are not on top of each other, the Join command will connect them with a straight-line segment. If the endpoints are aligned on top of each other, the Join dialog box will open. Click Corner to join corner points into one corner point with no direction lines, or to convert two curve points (or a corner point and a curve point) into one curve point with independent-moving direction lines. This is the default setting. Click smooth to connect two curve points into a curve point with direction lines that move in tandem. The filters on the Pathfinder palette combine multiple objects into one new object. The Combine filter is used in these instructions. Position two or more objects so they overlap. Press and drag a marquee around (or at least touching) all the objects. If the Pathfinder palette is not on the screen, click Window>Show Pathfinder. In the Pathfinder palette, click the “Combine” icon. 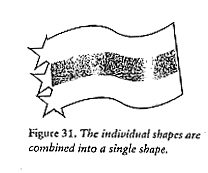 The individual objects will combine into one closed object and will be colored with the top object’s paint attributes.